Police say they are listening to concerns from Birmingham Sikhs who are demanding action against alleged forced conversions to Islam. 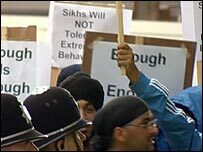 About 100 Sikhs protested on Saturday, marching from Handsworth to the police headquarters in the city centre. The march followed confirmation earlier in the week that police are protecting a teenaged Sikh woman who is said to have decided to convert to Islam. The protesters carried banners calling for an end to "extremist behaviour".